I've been making a variation of this Emeril Lagasse roasted cherry and angel hair pasta dish for years, but I haven’t really served it to Julia very much, until recently. You would've thought I had served her a dish of toad droppings sprinkled with rotten milk droplets, when I presented her with this dinner. She cried. She yelled. She refused to eat. She had a Class ‘A’ hissy fit. So. . . will you believe me when I say it’s really, really good, one of my favorite things that I make? I love children. . . SO MUCH. Position rack in center of oven and preheat to 350 degrees F.
In a large, glass baking dish, toss the tomatoes with the oil, garlic, vinegar, salt, red pepper flakes, and pepper. 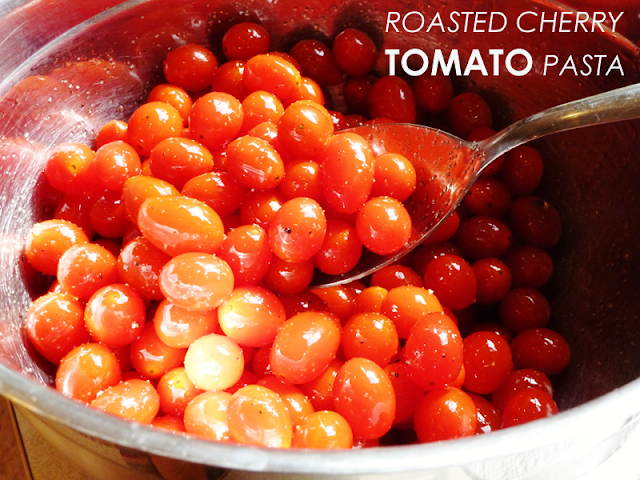 Roast until the tomatoes are tender, stirring occasionally, 40 to 45 minutes. Remove from the oven and add the basil, parsley, and oregano. (Most times I skip all of these herbs if pressed for time.) Stir well. Bring a large pot of salted water to a boil and cook the pasta until al dente, about 7 minutes. Drain and return to pot. Toss with the extra-virgin olive oil. Add the tomatoes and pan juices and cook over low heat until hot, 1 to 2 minutes. Add the ricotta salata cheese (I don’t use this and never have, I just use parmesan.) and stir until mostly melted, about 1 minute. Remove from the heat and transfer to a large serving bowl. Toss with the pine nuts (I don’t use the pine nuts.) and Parmesan cheese. Garnish with additional herbs, as desired (nah), and serve immediately. It looks delicious and so fresh with all those little tomatoes! I need to make this soon! I know al about the "Class A" hissy fit. Our daughter has those quite often. Just when I think, oh we're totally out of the tantrum phases....no we're not! The pasta looks de-lish, though! Last yr she claimed that tomatoes hurt her mouth. This summer she's been eating them off of our tomato plant the entire summer. But she likes most veggies raw, not cooked. WHY ARE KIDS SO CRAZY?? And why, oh why, did I say "through" instead of "threw"???? My daughter Keira sometimes forgets that she does actually like a certain food. She'll throw a fit, finally take a tiny bite, and then be like 'Oh yeah I DO like this!' P.S. Those pictures look amaaaazing. ha ha ha! you know, I have never forgotten I liked a certain food! Would be better for my waistline if I did!! This sounds like dinner at our place every single night with the only difference being that you actually managed to get Julia to take a bite. This looks so good. Your gorgeous pics are making me want this right now. Thank you Ness! Oh I wish I had the fit she threw on video. SO much crying and wailing!!! Rachael, that is a GREAT idea!!!! Did I mention already that she is a much better raw veggie eater than cooked veggie eater? Raw peppers and spinach, she adores. Cooked, she'll scream at it! And I'm back on the grid!!! Hello, it's been so long since I've commented!!! So, yum! Ha! Wonderful! Did she get the tomato thing from Lola? Isn't there an 'I absolutely will not eat a tomato' Charlie and Lola? Anyhoo, for my kids it's mashed potatoes!! Can you believe that? They will not touch them with a 20 foot pole, they gag at the smell. Thanksgiving is a very rough day for them. Too funny! My son drinks salsa-literally drinks out of a cup as much as I'll let him, yet still insists he HATES tomatoes (and onions, and peppers) and would NEVER eat them. Funny little creatures! I'm trying this recipe anyway. Ha! I love it! Mmm...This making me REALLY hungry! I wished this could work with my boy. Class A picky eater. I'll give it a try and see :D Thanks for the recipe! I just have to thank my stars that my kiddo isn't quite as picky as I was -- when I was her age, all I wanted was PB & J -- that's it! That looks amazing! I can't wait to try it! Yesterday, my son kept going to the freezer and taking out the ice cream and then melting down every time I said no. It was kind of incredible to watch. ha ha ha Jennifer, too funny! Your cutie pie is SOOOOO cute! This looks seriously delicious Melissa. LOVE pasta like this!!! I'm the creator of Julia's Bookbag and Julia's Book Boxes. Ask me about ordering the current book surprise box! Vintage, current, and unique book finds are my passion, along with treats, teas, and all things cozy.